Mississippi has had two state flags, and both have been closely associated with the state’s Confederate history. Mississippi and most other states did not adopt official flags until the Civil War. When Mississippi seceded on 9 January 1861 and thus became a de facto independent entity, the need for a state flag became obvious. Accordingly, on 26 January the state secession convention approved a committee report recommending a state flag “of white ground, a Magnolia tree in the centre, a blue field in the upper left hand corner with a white star in the centre, the Flag to be finished with a red border and a red fringe at the extremity of the Flag.” The blue field with the white star was the Bonnie Blue Flag made famous by Harry McCarthy’s 1861 song by that title. Mississippi was one of five southern states to incorporate the single-star motif into its new flag. Apparently not widely used, the Magnolia Flag served as the official state flag for the remainder of the Confederacy. In August 1865 a constitutional convention renounced secession and repealed many of the laws passed by the convention, including the law adopting the Magnolia Flag. For the next three decades, Mississippi had no flag. In January 1894 Gov. John Marshall Stone asked the legislature to correct this oversight, and on 6 February legislators passed a measure declaring that the state’s new banner would have “width two-thirds of its length, with the union, square in width, two-thirds of the width of the flag; the ground of the union to be red and a broad blue saltier thereon bordered with white and emblazoned with thirteen (13) mullets or five-pointed stars, corresponding to the number of the original States of the Union; the field to be divided into three bars of equal width, the upper one blue, the center white, the lower one red.” This turgid language masked the fact that the new flag’s field resembled the Confederate Stars and Bars and that its union or canton was the blue cross on a red field of the Confederate battle flag. This resemblance was of course no accident. The flag was likely designed by Sen. E. N. Scudder, a member of the Joint Legislative Committee for a State Flag. In 1924 his daughter told the Mississippi Division of the United Daughters of the Confederacy, “My father loved the memory of the valor and courage of those brave men who wore the grey [and] he wanted to perpetuate in a legal and lasting way that dear battle flag under which so many of our people had so gloriously fought.” On 7 February 1894, Gov. Stone, a Confederate veteran, signed the flag bill. Mississippi was the first state to incorporate the Confederate battle flag into its official symbolism, and no serious challenge to this iconography arose for nearly a century. In 1988, 1990, 1992, and 1993, Aaron Henry, an African American state legislator, introduced bills to change the state flag, but they never reached the floor. In April 1993 the Mississippi Conference of the National Association for the Advancement of Colored People filed suit in state chancery court contending that the state flag violated equal protection clauses in the state constitution, particularly a prohibition against “symbols or vestiges of slavery” on the state flag. 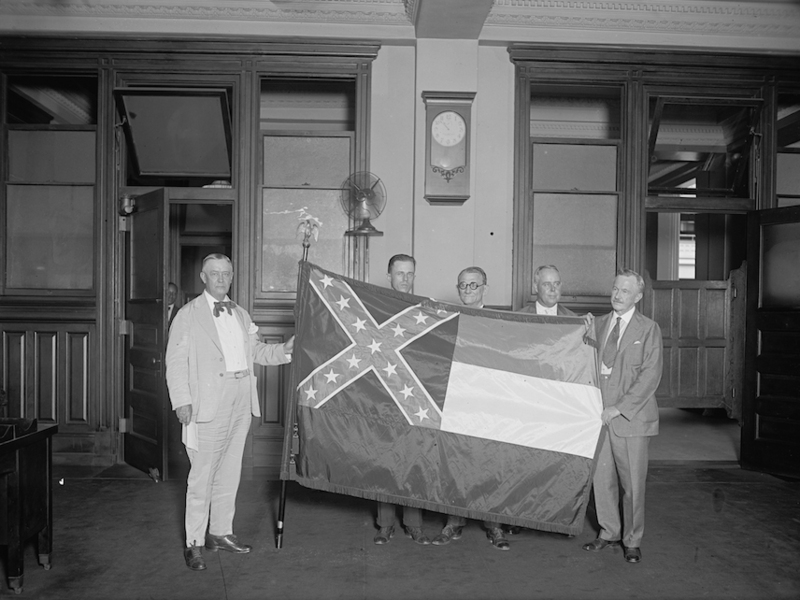 The state allowed the Mississippi Division of the Sons of Confederate Veterans to intervene as a defendant in the case, and in May 2000 the Mississippi Supreme Court ruled that the state flag did not demonstrably violate the plaintiffs’ constitutional rights to free speech and expression, due process, and equal protection as guaranteed by the state’s constitution. The court decision also dropped a political bombshell: Mississippi had not had an official state flag since 1906, when the flag law had inadvertently been omitted from the revised state code. Gov. Ronnie Musgrove, a Democrat, appointed a seventeen-member advisory commission chaired by former governor William Winter, a progressive Democrat and flag opponent. The commission held a series of five public hearings that brought out large and vocal audiences divided primarily along racial lines. The commission unveiled a proposed new flag and announced that the state’s voters would have the opportunity to decide between it and the 1894 flag. The new flag retained the 1894 flag’s field but substituted for the blue diagonal cross a circle of twenty stars: thirteen on the outside, representing the original thirteen states, six representing the sovereign entities (including the Confederacy) that have ruled over Mississippi, and one on the inside of the circle, representing Mississippi itself. A vote for the new flag would also approve two pieces of legislation that were intended to assuage fears of a wholesale assault on Confederate heritage. One act would prohibit the removal of any monument or memorial on public property or the renaming of streets, bridges, parks, or structures named for historical figures. A second act would designate the 1894 flag a “historical flag” that “shall be honored, protected and flown wherever historical flags are flown” and that could be displayed by historical or heritage groups, citizens, and businesses. The proposals asked supporters of the 1894 flag to surrender only the blue cross in the canton. The flag vote became in effect a referendum on the larger issue of Mississippi’s image. As in the other southern states facing flag issues, Mississippi’s business leaders and major media urged adoption of the new flag not only as a gesture of respect toward the state’s black minority but also as a way of “improving the negative image the state has outside our boundaries.” Predictably, national and international media dredged up Mississippi’s past racial troubles and the statistics on education that demonstrated the state’s stereotypical backwardness. Just as predictably, many white citizens resented implications that the state was backward and resisted demands that they perceived as renunciations of the state’s Confederate heritage. On 17 April 2001 Mississippians voted by a two-to-one margin for the old flag over the proposed new one. Voters split primarily but not exclusively along racial lines. African American leaders were mortified to find that some majority-black counties supported the old flag and complained that black voters simply did not appreciate the importance of the flag change. In the aftermath of the referendum, flag opponents threatened boycotts and vowed to simply stop displaying the state flag. Flag supporters vowed to consolidate their victory by using the state’s “indirect initiative” law to force a vote to have the 1894 flag incorporated into the state constitution. The issue of the Confederate emblem on the Mississippi flag returned to prominence in June 2015 in the wake of shootings in Charleston, South Carolina, perpetrated by a gunman who used the Confederate battle flag as a symbol of white supremacy. One by one, Mississippi colleges and universities announced that they would no longer fly the state flag as long as it contains the Confederate emblem. Towns and cities including Tupelo, Macon, Columbus, Grenada, Magnolia, Hattiesburg, Clarksdale, Starkville, Yazoo City, and Greenwood have voted or issued executive orders to remove the state flag from city property. In addition, prominent Mississippians in literature, music, sports, and government publicly called for the emblem’s removal from the state flag. Protests continue, and numerous bills to change the flag or have a statewide vote to change the flag have not passed the legislature.